Here’s another one from Janet, having her second week in Wales that year! The card was written on 5th October and she obviously did visit Caenarfon the next day, as the post mark reads ‘Caenarfon 6 OCT 1981 Gwynedd’. She’s put plenty of stamps on it to ensure safe arrival to me in Norway. The other post mark somewhat bizarrely reads ‘Today’s POST OFFICE in business to serve you’ – an admirable sentiment at the time, but one which seems ironic today as much of the POST OFFICE is privatised! 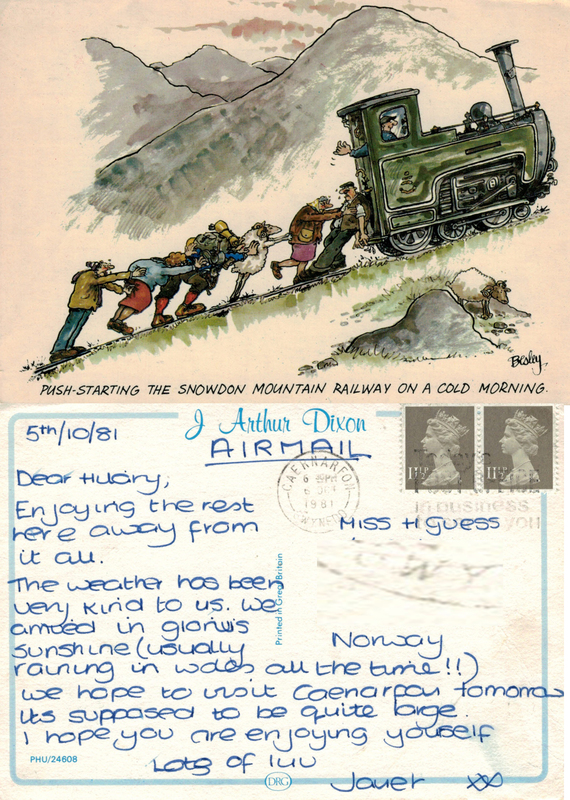 The cartoon on the front illustrates the famous mountain train which runs from Llanberis to the top of Yr Wyddfa (Mount Snowdon). 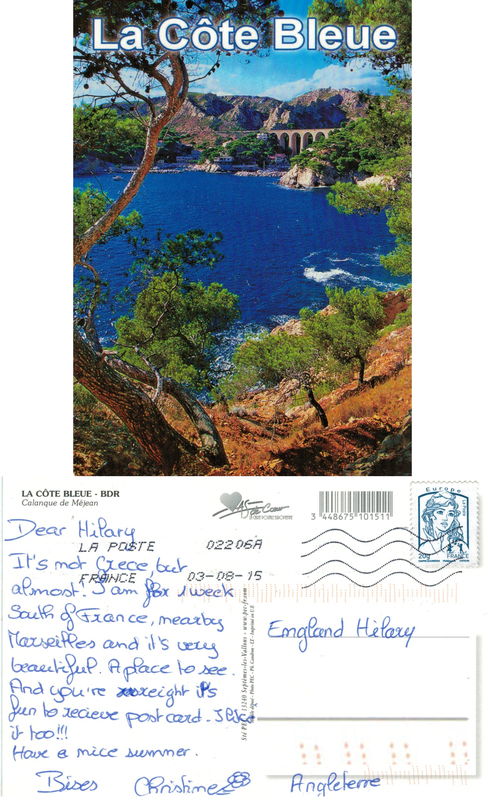 France again and a hand written, physical status update postcard from this month! The stamp carries the detail 20g which helpfully indicates the weight of mail for which it is valid. La Côte Bleue is to the west of Marseilles, so named because of the particular blue of the sea in the area. The picture shows one of the several viaducts carrying the rail tracks, which run for 32km offering spectacular views of the coast and all its narrow, steep walled inlets, or ‘calanques’ as they are known. 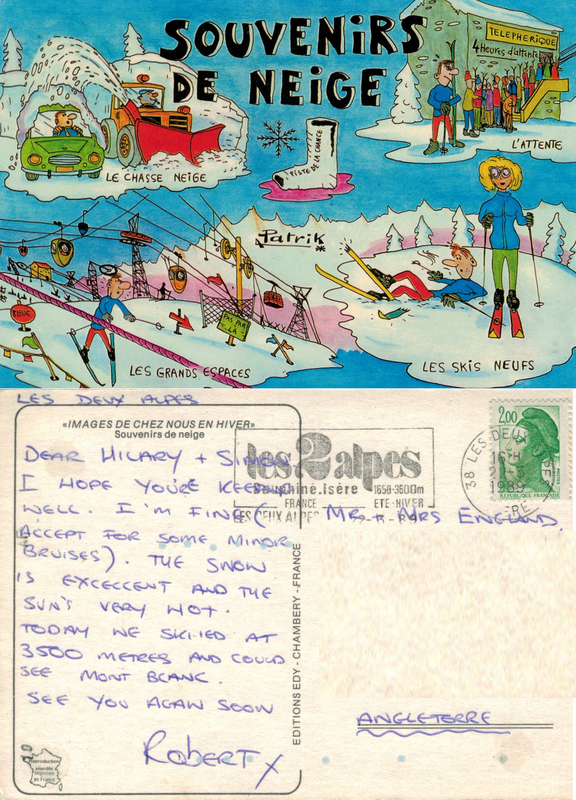 Swiss Christine has been inspired by this blog to send me another postcard to add to the collection -it’s good to hear from her again and to know that we have been exchanging news for 34 years! 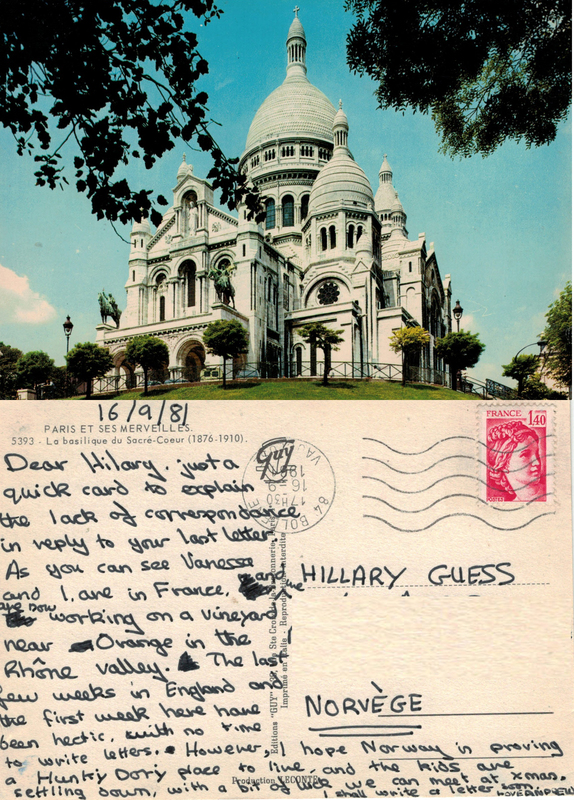 Post marked ’84 Bollene Vaucluse 17H30 16-9-1981′ which is in southern France some distance from the Sacré-Coeur featured on the front – it is unclear whether the card was bought in Paris or locally in Bollène. A mini update, where more news is promised, from a friend who was working and travelling his way round Europe. Andrew was also in my maths class at sixth form; an articulate contributor to any group discussion, maths related or otherwise, he was smart and held firm political opinions. Andrew wrote many letters and cards to me with details of his travels which I relished and appreciated during my time in Norway. We subsequently lost touch, but did reconnect, via the wonder of social media, a few years ago; didn’t quite get to the point of a face to face meeting though!